Sequins, gold, leopard print and shoulder pads are the main theme. 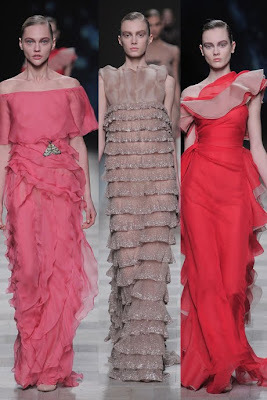 Valentino, now that's a lot of ruffles! Louis Voutin, Marc Jacobs decided to have "real" models -meaning slightly weighing more than runway models ;) at his show. With models such as Elle Mcpherson, Bar Rafaeli, Adriana Lima and Laetitia Casta. Yeay for Louis Voutin... as for the collection itself, I like the corsetiness of the dresses but there's a peasant-y feeling to it which I'm not really feeling... what do you think?